#Demonetisation taught us a LOT . In one stroke we had to shake off old, entrenched habits and imbibe a new way of living. It was inconvenient. But as a nation we adapted to it . Pre 8 Nov 2016 it would have been inconceivable that we could do without cash. Now , we reach out for our digital wallets quite naturally. We’re being conscious of what we buy . 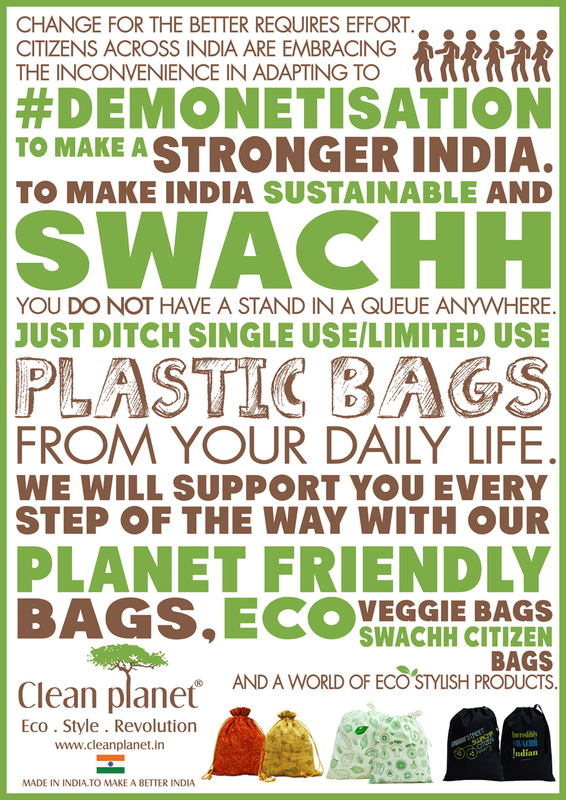 It’s time now that we #DeMonetise plastic bags from our lives . There would be temporary inconvenience . Soon , we will remember to carry reusable bags daily . This entry was posted on Monday, December 26th, 2016 at 10:10 am	and is filed under Eco-biz, Eco-living, Ideas we ♥, Make a difference. You can follow any responses to this entry through the RSS 2.0 feed. You can leave a response, or trackback from your own site.